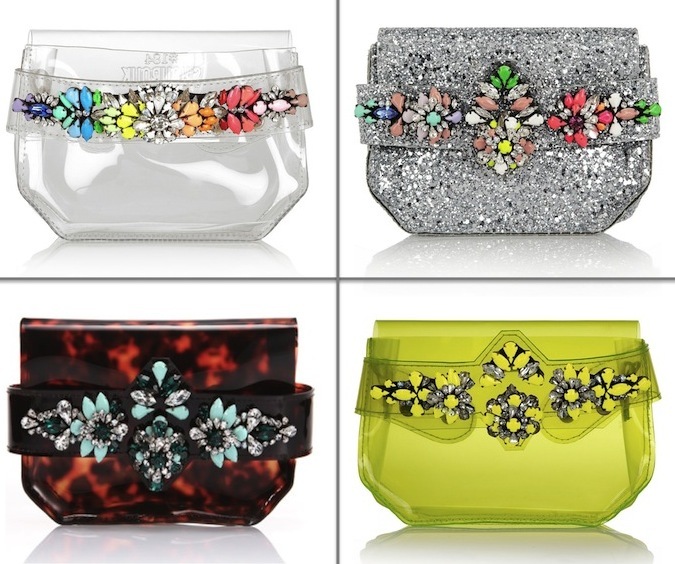 Can I get a show of hands for who else here is drooling over these Shourouk clutches? These perfect for party accessories combine a rainbow assortment of crystals and on-trend PVC material for modern, feminine clutches. They also come with a shoulder strap for those who want to be able to show off their handbag bling while carrying a drink, cell phone and shaking hands at the same time. Although I'm all about the top right glitter encrusted clutch, my favorite is the Tortoise shell - it just feels a bit more wearable to me. Do you have a favorite? oh my goodness. I am in love with these, and the jewelery is right up my street too! If only I had a few hundred pounds lying around for one of those beauties! These are so amazing. I love the clear/rainbow one! I love them! The brown is my favorite! I love the clear and yellow one! oh yes!! So in love with them all!! So cute and fun and they really go with everything! These are awesome! I would definitely rock that sparkly all glitter one. I love them! I wouldn't mind having ALL of them ;) My favorite has got to be the clear one. How cute is that? Love, love, love- all so stunning! I like my clutches like I like my jewelry- sparkly and bright.